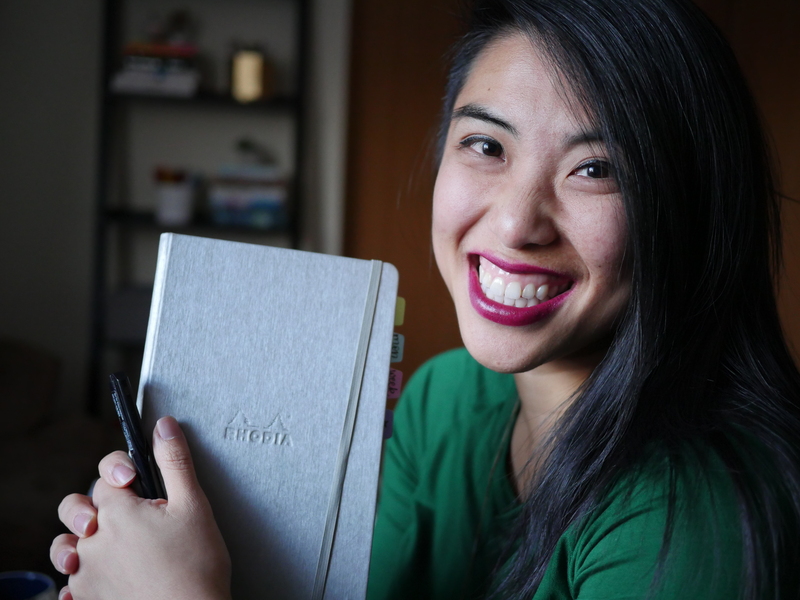 The bullet journal bug is catching on with more new faces – and I’m particularly excited to share Allison’s post with you today. She is bringing in discussions about sustainable and minimalist living – something I hope we can share more of in the future. Please enjoy and leave a comment to show her some love! Hi everyone! I’m so excited to be featured on Pretty Prints and Paper. I hope that I’m able to provide some inspiration through sharing my bullet journaling process. I hope you enjoy! I’m a twenty-something from Minneapolis. Currently, I’m in graduate school studying student affairs. I hold two graduate assistant positions and a retail gig, so basically, I run around like a crazy person most of the time (but it’s fun). I like being busy, I like trying new things, I like asking questions, and I like people. I have been bullet journaling since August 2016, so I’m still pretty new to the community. I spend a good chunk of my free time working on hand lettering, design, research, and organization of my bujo. I started bullet journaling because I felt like my life was disjointed. I had school, work, internships, family, health… and it was all disconnected. I wanted to understand my life as a functional system working towards a common goal. I’ve also always been really artsy and I liked the free-flowing format of the bullet journal more than anything. I never caught on to planners, and bullet journaling feels like my answer. By far the most powerful thing about bullet journaling for me is how it helps me achieve my goals. I’ve always been a procrastinator and a “live in the moment” person, so the idea that I could be so excited about planning makes me laugh a little. But it really has helped me gain a little control over my destiny without losing my free spirit and “go with the flow” attitude. Bullet journaling helps me organize my life in a way that feels comprehensive and meaningful. For this reason, I always include a mindmap of my life in my bullet journal. I started getting into minimalism after realizing that many things in life are not as complicated as they should be. This doesn’t mean my bujo is always color-free with lots of white space – in fact it can be quite the opposite! But it does mean that I’m constantly connecting back to what really matters and cutting out the small stuff. Marie Kondo’s The Life-Changing Magic of Tidying Up has been a global phenomenon that discusses how you can create minimalism in your home. I recommend it if you’re looking for first steps. After the first round of cleansing, I was hooked. My spaces felt clean and productive, and I actually found that my creativity skyrocketed because it wasn’t cluttered with all these other thoughts. When we have too much “stuff” – both physically and mentally – we lose track of the things we really care about and want. Especially with bullet journaling, it’s easy to get caught up in how everything looks (see my “embrace the messy” tip below). However, while design and art are important, it’s important to remember that a bullet journal is more than what you post on Instagram. It’s a tool that can help you fulfill your dreams! With minimalism and a clear focus, I have felt more free to pursue those “personal missions” or life goals. At the start of new semesters, I typically make a list of goals. I feel like it’s a good “fresh start” time that comes naturally in my life – but there are many others that could work too. Some people allot a year for their goals, but that feels too overwhelming for me, and usually you don’t need that much time even for big goals. For example, last semester I decided to switch yoga studios and start attending yoga five times a week. It doesn’t take a year to make that transition, even with setbacks. I think the shorter time period serves as good motivation and makes it harder to put things off. Note: I do not use SMART goals. Just a personal preference. A “Dreams and Inspiration” page (or a “brain dump,” a place where I can freely write any random thoughts or cool things I hear about). This is an important part of creating my personal mission. I use my brain dump to track where my thoughts have been, and then organize them – for example, if I’m thinking a lot about where my food comes from, I might make a goal to buy locally sourced produce. I always start my plans with my life mind-map and my goals/mission. I review my goals weekly and evaluate how they fit into my plans. This way, I can be intentional about spending my time fulfilling my personal missions. Around two months ago, I started using what I call purposeful living icons – small reminders each day to create balance between the areas of my life. Using the icons, I track how much effort I put into each area of my “life mind-map” that particular day. I use a scale of 1-5 to rate each area. So, on a day when I spent lots of time paying bills and making a budget, I might give “finances” a score of 5. On days that I spent completely alone, I might give “social” a score of 1. You can do this with goals, too. For example, I have been trying to go zero waste lately. On days that I created lots of trash, I would score a 1. You get the idea. The cool thing about rating different areas of your life with a number is that you can find averages and standard deviations. Basically, this means that at the end of each week I can calculate, on average, how much effort I put into something like cleaning and decorating my apartment. If the score is low, I can make a point to do more next week. The standard deviation tells you how balanced your life is. So, if the standard deviation is high, that means there is a lot of variation in your effort – meaning you’re probably putting too much effort into one area of your life and not enough into the others. I have this happen a lot with my social and entertainment categories (haha!) – meaning I spend too much time watching Netflix and going out to eat. It sounds like a lot of work, but it’s really no more difficult than filling out your habit tracker at the end of each day. I have my habit tracker and my purposeful living ratings on the same spread, so it’s easy to evaluate and reflect on the day without having to journal forever. This idea of purposeful living is at the core of minimalism. The idea is to reduce the small, unimportant facets of your life to make way for your real goals, and the areas of your life that matter. Hopefully, through doing this, you can work to create a little more balance in your life, too. Dive in. I can’t tell you how many times I drew a page on a sheet of copy paper before I drew it in my notebook, and it’s never worth it. It’s much better just to dive into your bujo and make it happen. You can always erase or use white out. Look back. My roommate made a comment about my hand lettering the other day, and I hadn’t even realized how much it had improved since I first started. I was shocked looking back on my first page ever and seeing how much different it looked. I also like to reflect on each month. I make a page called “Let’s Review [Insert Month Here]” with the headings “What worked?”; “What didn’t work?”; and “What can I do differently?”. It really forces me to go back and see the things that I didn’t fill out or that I bailed on after a couple of days, or things that were super helpful that I kept looking back on. Try it out. Sometimes I just feel so overwhelmed when I read why people like a certain spread. Should I do monthly logs? Weekly spreads? Daily spreads? There are so many options!! But the beauty of the bullet journal is that you CAN try them all out even in the same month. The first week of the month, do a weekly spread. Then do a different weekly spread. Then do a day-per-page. Then do 2-days-per-page. The world is your oyster. Enjoy the variation and don’t worry about it all being exactly the same. Trust your vision. When I first started I used Boho Berry’s guide and found that her spreads tend to work really well for me. I’ve adapted a ton of things, but for the most part the format has stayed the same and it was good to have a foundation. However, now that I’ve been doing it for awhile, I have started to have my own visions for what my journal should look like. I recommend trusting your gut and just seeing what happens when you put pen to paper. It’s great to get inspiration from the community, but it can also be really exciting to see what your own ideas can lead to. Embrace the messy. I think one of the intimidating things for bullet journalers just starting out is this idea of perfection – this idea that somewhere in “bujo world” live thousands of perfect humans that make perfectly straight lines and whose lives look like an Anthropologie catalog. THESE PEOPLE DO NOT EXIST. Even the most experienced of brush letterers and savviest of spread designers use just as much white out (if not more) than you and me. PERFECTION IS NOT THE GOAL. Some of my messiest pages have given me the most from my bullet journal. They don’t look perfect, but they worked better than some of my best-looking pages. want more newbie bullet journaling advice? I write a letter to you here. I hope you found some helpful tips in this post and I am so thankful for the fantastic bujo community! Thank you so much for reading and happy journaling! Follow me on Instagram @sixth_and_forth and stay tuned for updates on my lifestyle blog, sixthandfourth.com. Thank you for sharing your insights. Great post. Usable content. I love this post! I started a project book in bullet journal style at the beginning of the month. I like that mentioned zero waste m it’s a really hard goal and it’s good to track daily and make note of when you did succeed, because it’s impossible to succeed all the time. Thanks for this post! I really enjoyed reading it. I’ve been reading the book that was mentioned, and it has had great results in my life too. There’s a lot of beauty in less.